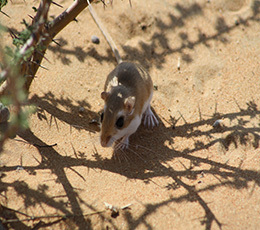 The study aimed to provide a baseline survey of the rodent communities in DDCR; and to assess the community structure and the distribution of the individual rodent species and species distribution patterns on different habitat types (Sand Dunes and Gravel Plains)The survey consisted of 40 random selected points evenly distributed between the sand dunes and the gravel plains with 12 traps been placed 10m apart along the four compass directions. Trap lines were set for a period of 6 nights at each site. Trapping success tends to peak on days three, four and five. While autumn was the best season for trapping, New Moon and rain were the best moon phase and weather conditions respectively for trapping. Meriones crassus: Trapped from four sites, 9 individuals were trapped consisting of 7 males and 2 females. Gerbillus nanus: Trapped in three sites, the 4 individuals caught all being male. Acomys cahirinus: Only trapped in one site a unique rocky habitat in the DDCR, Two individuals were trapped both which were males.